House Shopping 101: “Don’t worry, the City inspected it.” #1:The cut column. It’s a common sounding from the selling parties on new or almost new homes. Especially those built without Tarion warranty. “Don’t worry, the City inspected it”. As an inspector serving the buying community, I am often amused by that statement. 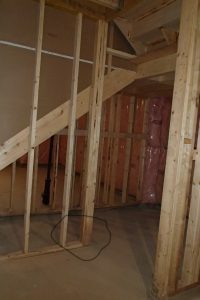 My income on new and nearly new home inspections relies directly on identifying the leftover issues after all the builder and municipal inspections are complete and the first owner has taken possession. These issues don’t go away on their own, and I also find “builder issues” on resale homes, even up to 50 years after original construction. In the photo, the structural column has been cut and moved. This is brand new 2018 construction in Oakville. You can identify the structural columns in the basement because they pass through the concrete floor slab. Their base is below the floor slab, on the footing. Polyethylene is wrapped around the wood column to separate it from the concrete floor slab. This column supports the first storey floor structure at the intersection of two laminated beams. This structural column was cut and moved because it didn’t align with the members above that it was intended to support. 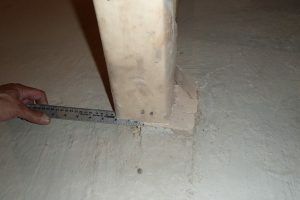 The ruler shows that more than half of the width of the 2 by 4 built up column is overhanging the original “base”. A couple of nails are wacked in for good measure. It took me a few minutes to find this in the basement, it was out in the open for me to see, and for any other inspectors who preceded me. Columns are sized in the original design to match the load and the width of the members being supported. This column is supporting the corner junction of laminated beams at the floor opening. This column is no longer a column. Don’t hesitate to have new or nearly homes inspected by a professional. The not too pleased homeowner now must pursue the builder through the Tarion warranty program to get this made right. Not an easy task if the builder decides to shrug his shoulders and pretend everything is OK.